What are the young people up to these days? Virginia’s immigrants: Where do they come from and where are they now? In January, I spent some time discussing SNAP in Virginia here and here; at the time, there was a lot of hypothesizing about what kinds of changes were in store for the program. In early February, the Farm Bill was passed by Congress and signed into law by President Obama. This bill reauthorized Federal funding to the SNAP program, and included an estimated funding reduction of about $8 billion that is projected to influence hundreds of thousands of SNAP recipients. Virginia remained almost entirely unaffected by changes to the program, as did many other states. For details about the changes the Agriculture Act of 2014 made to SNAP, check out this article, or this synopsis of the Farm Bill conference agreement. Maybe you’re not all that interested in the outcome, or maybe you’re the type to review the summaries, ponder the formal text of the final act, or even pore over helpful timelines to figure it out. Either way, you might still be wondering: why are food stamps included in an agriculture bill, in the first place? A satisfying answer requires some history and a little understanding of the ins-and-outs of Congress. If you think this round of Farm Bill reauthorization was unusually contentious, let me assure you that this has been politically complex from the get-go. Let’s take a look at this long-standing couple with the “It’s Complicated” status. During the Depression, unemployment was high and farmers were paid to produce more crops than people actually bought. Toward the end of the 1930s and into the 1940s, some pilot food stamps programs were administered by the United States Department of Agriculture (USDA) in order to dispose of surplus crops. Under this model, individuals could buy vouchers that they could later redeem for food. Why buy vouchers? Because they offered a great deal: for one dollar, you would receive both a one-dollar voucher for standard groceries and an additional fifty-cent voucher for goods that were farm surplus. This deal let people eat on the cheap and prevented surplus crops from going to waste. The original model was designed to support farm subsidies—and the marriage between farms and food stamps was born. The government wanted to pay farmers to grow food in the face of low demand, and this program helped make the system more efficient. It was particularly popular with rural (usually Southern) Democrats. Although these efforts faded from popularity during World War II, mostly because farm surpluses dwindled during that time, interest from pro-agriculture members of Congress picked up again in the 1950s. Coincident with the resurgence of support for farm subsidies, urban Democrats grew increasingly frustrated as their efforts to launch social welfare legislation were stifled by conservatives who held a majority on appropriations committees. However, the possibility for a farm legislation-social welfare quid pro quo was hard to miss. Urban Democrats on the Agriculture Committees were in a position to support agricultural subsidies in exchange for the backing by rural (and more conservative) Democrats for a food stamp program specifically geared toward the poor. This alliance between rural and urban Democrats would provide enough votes to get the bills out of committee. Then, as long as the two funding bills came up in quick succession on the floor, it was anticipated that each would be met with a favorable vote, since supporters of one would be expected to back the other. By the time a national bill was on the table in the early 1960s, food stamps were no longer exclusively intended to redistribute farm surpluses. However, the expectation for continued mutual support for food stamp and agriculture legislation was made somewhat explicit by House leadership. The first nationally funded food stamp program was passed in 1964; the House vote was immediately followed by an approval of that year’s farm bill. Over the next several years, it became clear to each chamber’s Agriculture Committee that the increasing popular support for food stamps legislation would eventually allow it to pass a floor vote even without the votes of rural, pro-agriculture members of Congress. 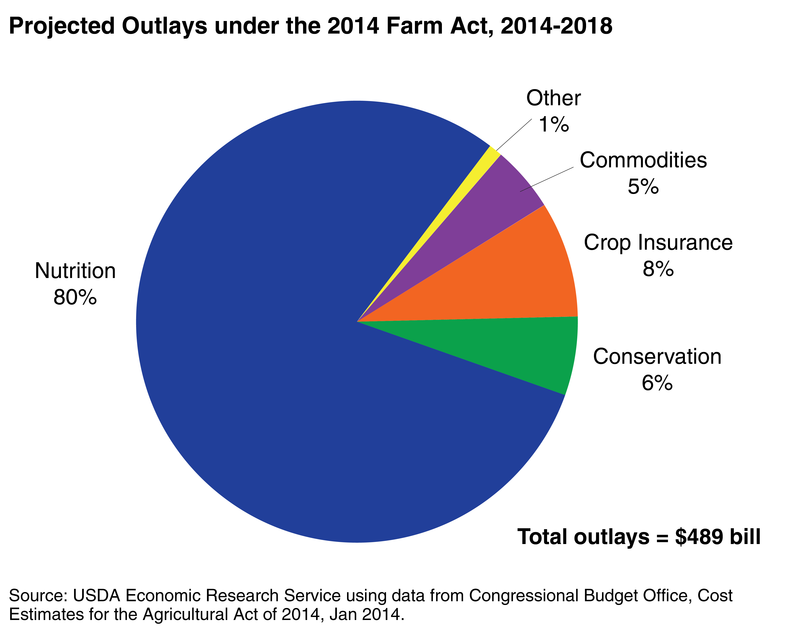 This put the “you scratch my back…” support for less popular agriculture legislation in peril. To the leadership of these agriculture committees, it made sense to make the link between farm priorities and food stamps concrete, by rolling them into one bill. The first such combined bill made it through Congress in 1973, and went into effect the next year. Note, though, that not until 1977 did legislation drop the requirement to purchase some food stamps in order to receive an additional amount in vouchers. Today, legislation for food stamps—or SNAP, as the program has been officially known since 2008—remains in lock-step with agriculture legislation, though this is subject to continued debate. Why does this matter to you? Maybe you’re not sure that crop insurance a makes a ton of sense, or perhaps you’re even skeptical about the current structure of SNAP. Mostly, even though you can’t ever really judge a human relationship from the outside, you can learn, make opinions, and communicate to your legislators about the funding relationships created by law… and the individual “partners” in this odd couple. But, who doesn’t love a good story about an unlikely pair?